When I was in elementary school, I was a regular at our public library, namely, that A/V Department. It helped that my mom, for a time, worked there in the Children’s Books department and that it was across the street from our church and a block from the Jr. High School. My sister and I still boast of the unmatched movie selection our library had. So I walk into the room and fate had stepped in. I didn’t wait two seconds before asking the library worker what was playing and he pointed me to the CD case sitting on the display under the “Now Playing” sign. The song was Orinoco Flow by Enya. Wow. It was such a magical song to me – unlike anything I had ever heard. Otherworldly. Sounds I had never heard. After that I had to explore everything the library had of Enya. 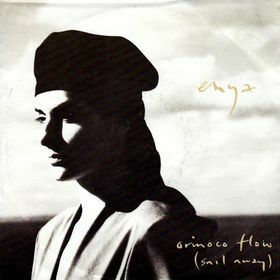 Enya has come in and out of pop culture, most recently involved with the Lord of the Rings trilogy. You can still, time to time, catch Oronico Flow. Here it is for your enjoyment.